New Zealand Handmade: What does it mean to be “a successful artist/ crafter”? What does it mean to be “a successful artist/ crafter”? Winter time always proves to slow down sales, galleries return unsold items and want to exchange for something new, markets are very quiet, and if your the better half slips in the question whether it might be beneficial for the finances to stop making until the boxes with ready-to-sell items show reduced contents.... your heart sinks and you ask yourself why is there only little interest in your creations, why you are not “successful”? But.... can you ever stop creating and making and working on “the” piece to bring in some recognition and/or at least a little bit of turnover? What is the driving force that inspires us to create? And what really is “success”? And all it takes to spark new energy is a commission! 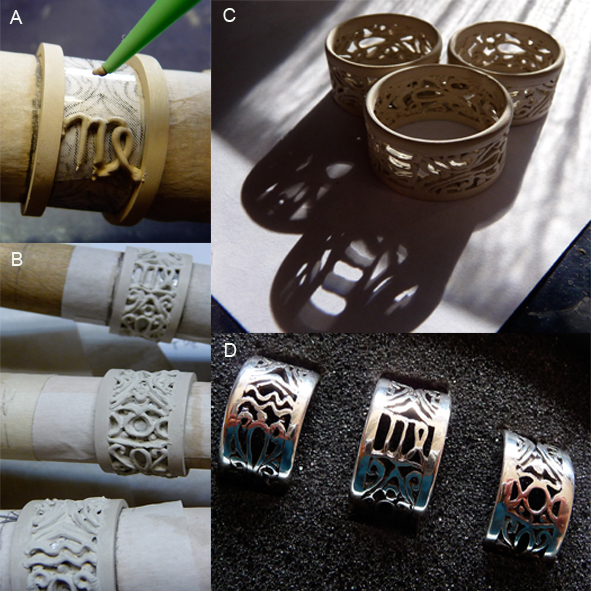 Three rings with the same pattern except for one detail to come in for the individual wearer. Can you recognise what it is? Thanks Ingrid a great read on success, via that link. Beautiful rings Ingrid. Love the zodiac symbols :). And thought provoking reading re success.